9 Shale Gas Extraction Issues in India – If US can then why can’t India? 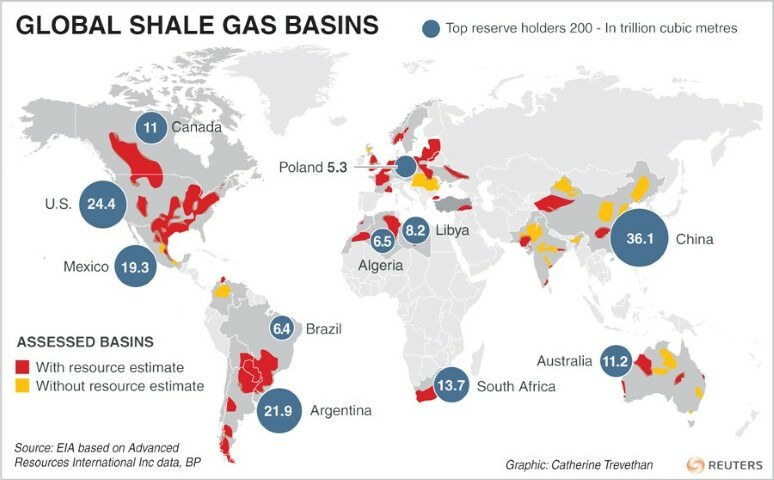 Unconventional Gas Reservoirs: Shale Gas – Coalbed Methane. Shale Gas Reserves India, World. 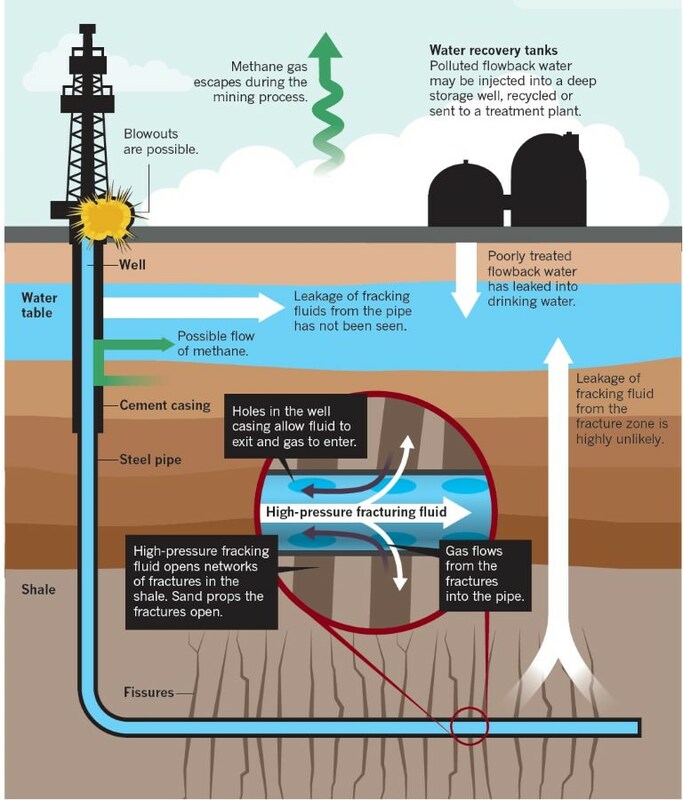 Extraction of Shale Gas: Hydro-fracturing or Fracking. Problems Associated. Conventional reservoirs of oil and natural gas are found in permeable sandstone. 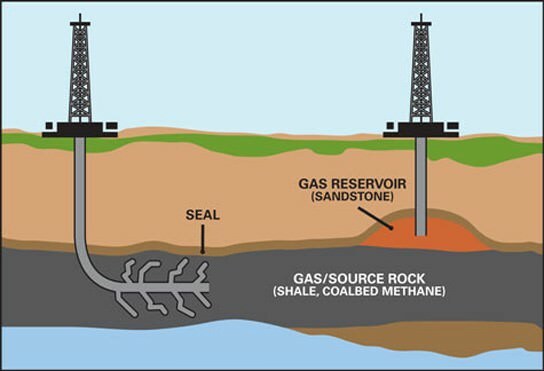 Unconventional Gas Reservoirs occur in relatively impermeable sandstones, in joints and fractures or absorbed into the matrix of shales [Shale is a Sedimentary Rock], and in coal. Given current economic conditions and state of technology, they are more expensive to exploit. Example: Tight gas, shale gas, and coalbed methane. Considerable quantities of methane is trapped within coal seams. A significant portion of this gas remains as free gas in the joints and fractures of the coal seam. Large quantities of gas are adsorbed on the internal surfaces of the micropores within the coal itself. It is now becoming an important source of natural gas. Unlike much natural gas from conventional reservoirs, coalbed methane contains very little heavier hydrocarbons such as propane or butane. The presence of this gas is well known from its occurrence in underground coal mining, where it presents a serious safety risk. Fire Accidents in Coal Mines are mainly due to Coalbed Methane, and Lignite deposits which undergo spontaneous combustion. With one of the largest proven coal reserves, and one of the largest coal producer in the world, India holds significant prospects for commercial recovery of coalbed methane. The country has an estimated 700-950 billion cubic metre of coalbed methane. The state-run firms are holding mines in joint venture with private companies and the latter do not have rights to explore coalbed methane [private sector companies at present have no rights to extract unconventional gas reservoirs –– coalbed methane and shale gas]. CBM extraction falls under Ministry of Petroleum & Natural Gas whereas coal mining falls under Ministry of Coal. Contractors are not allowed to mine gas from coal seams or coal bed methane (CBM) and coal in the same block due to the turf war [common feature of Indian Bureaucracy] between the two ministries and other associated bureaucratic hurdles. Extracting unconventional gas is a capital intensive process and at the present levels of gas prices, the companies cannot recover their investments. 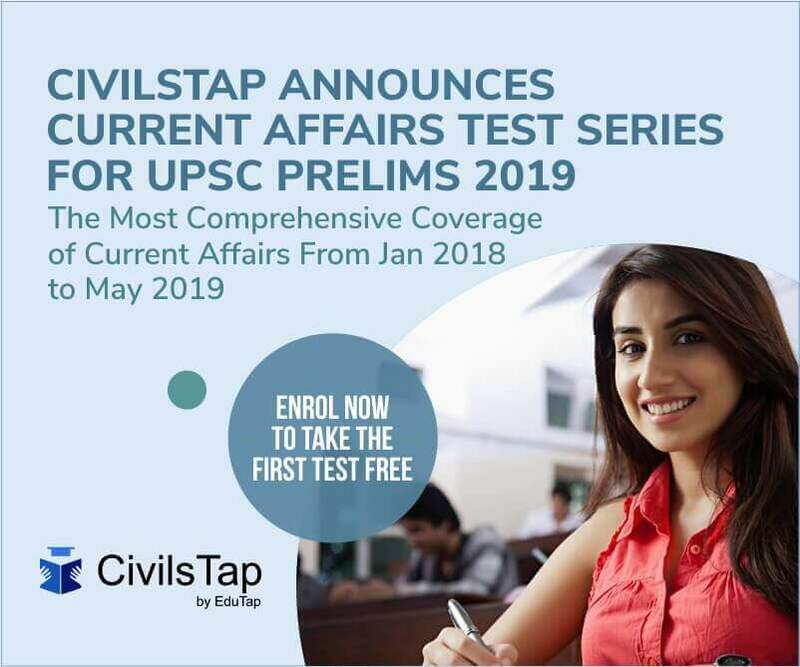 The technology required is very advanced and the public sector companies have very weak organizational setup to efficiently handle such technologies and extract gas economically. Private sector companies have necessary financial capabilities and managerial skills but there is no hope due to restricting laws and low gas prices. In India, gas pricing is a contentious issue. It has never been easy satisfying all the stakeholders involved [consumer, government, gas companies]. Gas pricing will be critical for private companies before they can invest in unconventional gas projects so that they can calculate their profit margin. Shales are fine-grained sedimentary rocks formed of organic-rich mud at the bottom of ancient seas. Subsequent sedimentation and the resultant heat and pressure transformed the mud into shale and also produced natural gas from the organic matter contained in it. The rest of the gas remained locked in the nonporous shale. 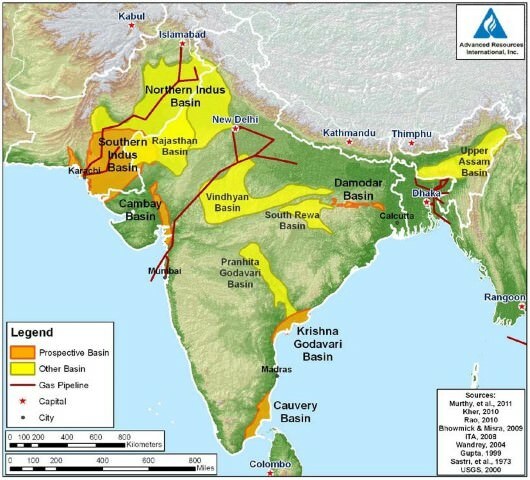 Basins of preliminary interest identified by Indian geologists are the Cambay Basin in Gujarat, the Assam-Arakan basin in northeast India, and the Gondwana Basin. Indian engineers have gathered experience on fracking – the technology to find shale gas – by spending time in the US and are now able to hunt for the scarce resource on their own. Fracking technology sends high pressure streams of water, sand and chemicals into shale formations to bring up the oil and gas. Environmentalists have objected to fracking because of the damage to forest cover and possible contamination of ground water. One estimate by Indian scientists places potential reserves at as high as 527 tcf. Shale gas occurs frequently at depths exceeding 1,500 metres (5,000 feet). Extraction is done through horizontal drilling through the shale seam, followed by hydraulic fracturing, or fracking, of the rock by the injecting of fluid at extremely high pressure. Shale rock is sometimes found 3,000 metres below the surface. After deep vertical drilling, there are techniques to drill horizontally for considerable distances in various directions to extract the gas-rich shale. A mixture of water, chemicals, and sand is then injected into the well at very high pressures to create a number of fissures in the rock to release the gas. The process of using water for breaking up the rock is known as ‘hydro-fracturing’ or ‘fracking’. The chemicals help in water and gas flow and tiny particles of sand enter the fissures to keep them open and allow the gas to flow to the surface. Can quickly turn water into a very thick gel. Adding guar gum increases viscosity of water and makes high-pressure pumping and the fracturing process more efficient. High viscosity water is much more effective at suspending sand grains and carrying them into the fractures. The guar been is grown mainly by farmers in Rajasthan and Haryana. Earlier, guar gum was used mainly as an additive in ice creams and sauces. But with the discovery of its use in shale gas extraction, its price shot up enormously. However, industry officials say that the treated water can be re-used for further fracking and need not be disposed of at all. All the water required must be obtained from rain water harvesting. Recycling and reusing of water utilized for fracking should be the preferred method for water management. Enforcing clear and practical legislation on environmental and water issues. 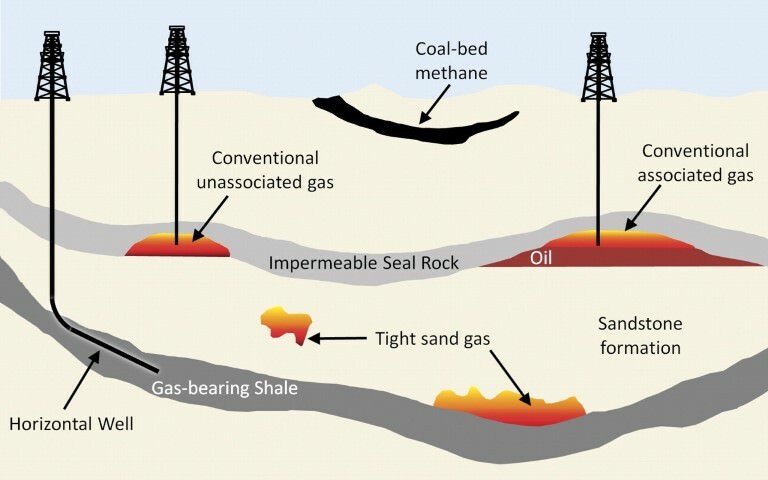 Coal bed methane (CBM), which is extracted from coal beds, is also an unconventional gas and, in terms of depth, occurs much closer to the land surface than shale gas. Shale Gas Extraction Issues in India – If US can then why can’t India? India suffers from physical and economic water scarcity whereas the U.S. do not have the same water worries. In the US, the natural gas department is exempt from scrutiny for chemical injection in the ground (it exempts companies from disclosing the chemicals used during hydraulic fracturing). There is no such legislation in India. In US, the citizen or resident owns the resources that lie beneath the ground. In India, soil below the land is a public property and the companies must follow all the necessary rules to acquire it. The US has mapped all its shale reserves. In India there is clarity on the exact recoverable shale reserves. The population density is much lower in the US and they can afford to do it. Government-issued leases for conventional petroleum exploration do not include unconventional sources such as shale gas. All locations in US is well connected with gas pipelines. Bulk of the reserves in eastern India lack the necessary network of pipelines to transport the gas–a task that many private operators are wary about undertaking. India has 293 billion tonnes of coal lying under its soil. Extraction is complicated because of environmental issues. But, ‘underground coal gasification’, can create 6,900 trillion cubic feet of gas which is way HIGHER than shale reserves. India’s shale resources at a more modest 65 trillion cubic feet. India’s CBM potential is estimated at 450 tcf. So, focus must be on CBM exploration rather than on risky shale business. Answer Yourself with the help of above points.